As I’ve mentioned over and over, my mother disliked cooking… quite a bit. I’ve often said that I find absolutely comfort in cooking, stirring a pot of Risotto is like therapy to me. It’s time that I get to clear my mind, forget about sticky floors, bananas shoved under my couch and yogurt in my hair. When I cook I feel at peace. My mom never felt any of that. 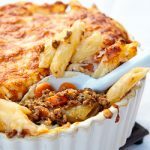 Her staple dishes were things she could throw into one casserole dish and shove in the oven for a couple of hours. But when the ‘domestic goddess’ in her started getting anxious, she made Chicken-Fried Steak, although, we never knew it was called Chicken-Fried Steak. She just always called it “Tenderised steak” because that is the cut of meat she used. But recently while watching an American cooking show, I realised that what my mother had cooked for us for years, is actually an American favourite. I was quite excited to have a more suitable name for one of the meals that I have attached a high comfort level to. It’s not great to say “Tenderised Steak” when someone asks you what your moms best dish was. So yesterday I set off to the supermarket in search of Tenderised steak and was quite disappointed when I could only find Beef schnitzels. It only occurred to me after I had gotten home that I should have bought Sirloin steaks and just pounded them out myself. But that I’ll do next time. I read up about Chicken-Fried Steak a bit and found it’s also called Country Fried Steak and that the Americans like to serve it with gravy. I made a small quantity of the gravy as I found in a recipe, but I have to be honest. It wasn’t great. It was quite gloopy and starchy and I’ve always preferred to eat this with just a squeeze of fresh lemon juice. You could also serve this with cheese sauce if you wanted something saucy to go a long with it. Heat a large frying pan/skillet and add 2tbsn oil. Place the eggs and the flour in two separate shallow bowls/plates. Place the steak first in the flour, then dredge in egg and then again in flour. Fry for +- 2-3 minutes per side until crisp and golden. Serve with fresh lemon juice (or cheese sauce if desired). There is also a meat tenderizer which is called “Fast Cutlet Maker” that crush the meat lobes and after it have clear squared pattern on it. It is popular in Poland. I made these for breakfast. They were easy to make and came out tender and delicious. I also made gravy out of the dripping. My husband now wants to know when I will make them for dinner !??????. Thank you so much for sharing . Where is the recipe for the cheese sauce? You could use any steak really, just make sure you thin it out with a meat mallet before you bread it. Like your mom, I hate cooking too. But I tried this recipe & it’s out of this world! Thanks for sharing. God bless you. Thanks so much Ayesha! So glad you liked this recipe. We don’t use gravy on our, we actually dip it in honey! It is a lovely combination of sweet with salty! I’m not detracting because it looks wonderful and I could eat some right now, but isn’t it actually a traditional beef schnitzel? It is how I learned to cook schnitzel from my mother. Lynne, I always make schnitzel with breadcrumbs, not flour and I know in the US they call this chicken-fried or Country-fried steak. We had these steaks last night, and it was fantastic! I also enjoyed telling my partner the story about your mom making it for you… so I guess the sentimental story made it more fun to eat. Nadia, it’s important that you cover the steaks in flour first, then egg and then flour again. That way the egg sticks to the first layer of flour which makes the second layer of flour stick better. Glad you enjoyed it. 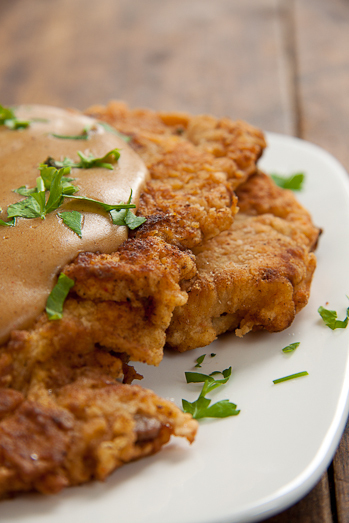 Country fried steak was a staple in our home growing up as well. Mother served it with gravy but not a milk gravy. If your gravy was too thick you can thin it down with water. I find that salt and pepper can make all the difference in the flavor or the gravy so if at first it tastes bland, season, season, season. Also, I am from Florida and we always called it country fried steak but my friends from Texas always called it chicken fried steak. Martha, I often do thin it down with water. Living in South Africa, this is not a dish that is too well-known and my mom just called it “tenderised steak” and I only realised it’s chicken/country fried steak when I started my blog and started trawling the internet for ideas. If the picture is the meal you cooked, I can tell you that it’s the wrong gravy, but the steak portion looks wonderful. I’m not sure if it would make a difference to you, but when we eat/make Chicken Fried Steak, we make a White gravy. And if you’re in the South, you pour the same gravy over fresh, fluffy biscuits for breakfast. Sometimes you eat Chicken Fried Steak for breakfast too, however, I’ve never done that. Candee, thanks for your comments. Because I am not from the USA I have no idea what the gravy is meant to look like, I just make the gravy in the same pan I fry the chicken in so that I get all that extra flavour. I also use chicken stock and just a bit of cream for the sauce so that It’s not too rich. Ally, to make the white country gravy, you use the pan drippings mixed with some flour, then use milk instead of stock. And plenty of black pepper! 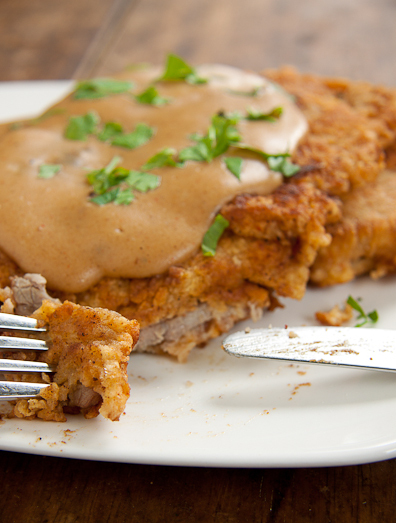 i LOVE chicken fried steak… well pretty much anything fried, but especially this. it looks amazing- thanks so much for sharing! 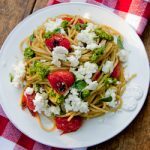 This is my guilty pleasure- the only time I get it is when they make it at the cafeteria at my work, but this recipe looks so delicious I just might try it at home! My mom also made this when I was a kid! Thanks for reminding me of it, Ally. It’s good to have a name and recipe for it. YUM! I shall be making that for dinner tonight. My brood won’t know what hit them! Not much of a cook, though I can be if I apply myself! Hungry-Lea : What did they think? Flee: Hehehe, did he like it? Zabwan: I don’t know if this is the correct recipe but I know this was how my mom made it. Lori : oh YUM! Aioli would go SO well with this! JT : I believe you! It was while watching DDD that I saw this and was reminded of my mom’s version! Sandra: I hope you do! Let me know if you liked it! That’s my idea of comfort food! I could eat that right now… wow.